This is part of a 2-part series with Farm Rich Smokehouse. Part 1 of the series can be found here: Halloween Crafts for under $5. This post is brought to you by the wonderful people at Farm Rich Smokehouse. All thoughts an opinions are my own. Having easy to make finger foods is my favorite way to serve food at a party. Simple one or two bite-sized foods seem to work right. So, just in time for upcoming Halloween parties I created Chicken Bruschetta Bites that are sure to be gobbled up by all the goblins and ghosts at your party. I loved how convenient it was to use Farm Rich Smokehouse products for this recipe. 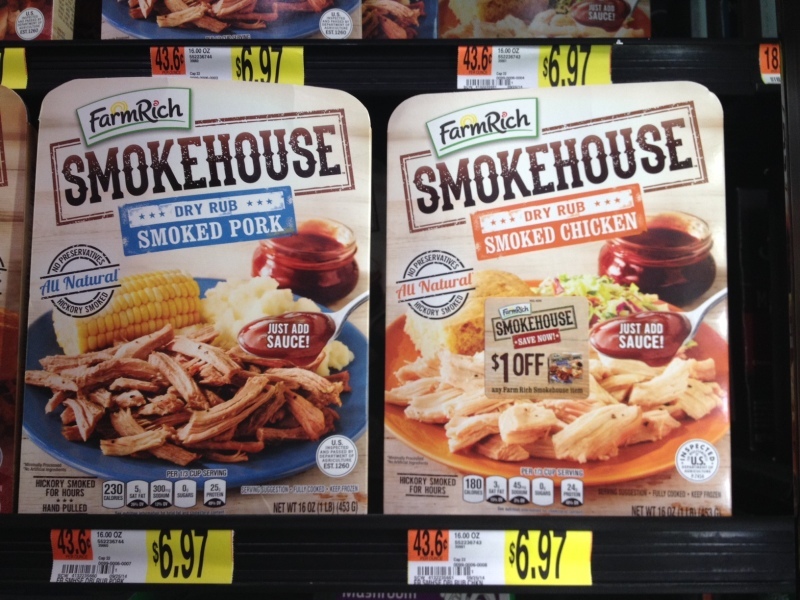 Farm Rich Smokehouse product is found in the frozen section at Walmart. There are a variety of products with a very nice price of $6.97 at my store. The new product line includes Pulled Beef Brisket in a Sweet & Smoky BBQ Sauce, Pulled Pork BBQ, DOuble Rubbed Dry Smoked Pork, and Double Rubbed Dry Smoked Chicken. Save money on your purchase of Farm Rich Smokehouse products by clicking and printing this coupon. I loved how convenient it was to use Farm Rich Smokehouse Dry Rub Chicken for the Chicken Bruschetta Bites. 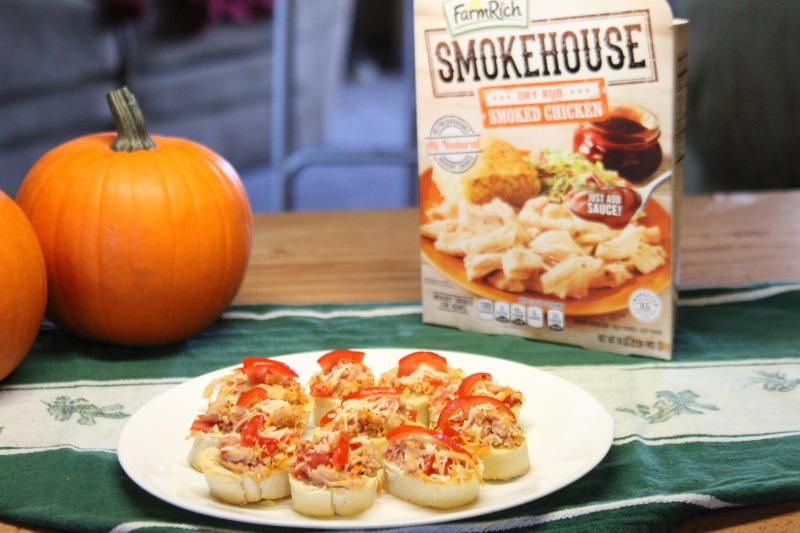 The Farm Rich Smokehouse products are cooked and already shredded, which makes cooking meals quick and easy. The Farm Rich Smokehouse Double Rubbed Dry Smoked Pork (or Chicken). is all natural, pre-pulled meat that is ready to use. I love hassle free food! Place slices of french bread on a baking sheet. Brush the cut side that is facing up with olive oil. Bake in a 350 degree oven for 5 minutes or just until lightly toasted. Remove from oven. In a medium-sized bowl, combine tomato, chicken, garlic, salt and pepper. Mix well. Top each slice of toasted bread with a heaping tablespoon of bruschetta and top with a tomato slice. Bake for 5-10 minutes or until heated through. These look scrumptious! I love to try new and different kinds of bruschetta and I love the idea of topping it with the chicken. So yum!!! Can’t wait to try it! I love that these are so easy to make. They look delicious! Great job! These look simple and yummy. Must try! Your bruschetta bites look simple amazing! I’m such a bruschetta person and I’m going to add this recipe to my collection. Thanks! These look AMAZING. I love your photos! Oh man those look good! I could eat those. I don’t eat pork because it gives me migraines, but I use to love it. HAha I hope your having a great day! Those looks so easy and perfect for any party! Yummy! I love bruschetta in all forms. Anything with bruschetta is delicious. and fi it can be fast too? Even better! Thank you! I am drooling over here. That is just the kind of snack that the hubby and I love. I bet those are tasty! Pulled pork is one of my favorite foods too. Happy Halloween! These look delicious! And the Monster Claws are so cute and clever! Those look fantastic and so easy. Smokehouse BBQ is such a great way to eat a delicious meal! Those look really good. Easy and tasty. This looks so tasty! I love Farm Rich products. These look so appetizing. I love bite sized anythings, because they are like tiny amuse bouches! 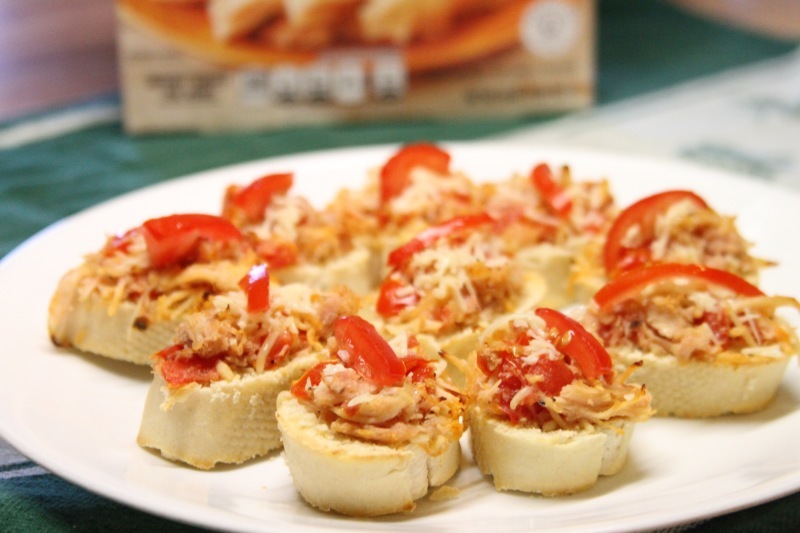 We love BRUSCHETTA – I have never though to use chicken. I will be giving this a try – looks tasty! I love brushetta. Could seriously at the stuff every day if I could. It such a healthy, wonderful thing. I’ve never put chicken in it like this. I have however put it on top of my chicken. Ohhh delicious! These look great, I love bruschetta! Mmm this looks so delicious! I think I’m going to make some tonight (no tomatoes on mine). These are awesome for so many types of parties. I will be pinning to use at some point soon..
What a great way to use the smokehouse BBQ. I’ve been seeing it in the stores but haven’t brought one home yet. I might now! These bruschetta bites look so yummy! I’d love to try the Smokehouse BBQ. Those chicken bites look as appetizing as can be. They’re what I’d try first! These are just SO clever! I love how easy they are to make. I love easy and tasty party snacks! They’ll be great for a football party soon! These Chicken Bruschetta Bites looks so delicious and easy to make. They would be great for a dinner party. I love this recipe! What a great idea. Can’t wait to give it a try. These look delicious! I will definitely be trying them! Thanks so much for linking up with us at Mommy Needs a Timeout Thursday! See you this week! We party at 8 pm EST on Wednesday! Yummy! These look amazing! Thanks for sharing! I can’t wait to try them! PINNED! 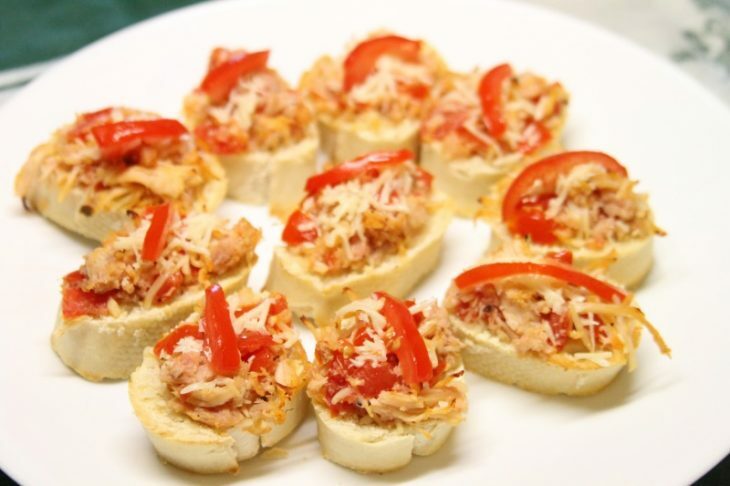 I just pinned your Chicken Bruschetta Bites, a great appetizer! Thanks so much for sharing with Full Plate Thursday and hope you are staying warm in all this cold weather. Love that these can be made so quickly for parties. Thanks for sharing it on Merry Monday. Hope you can join us again tonight at 6pm PST. Oh these look yummy! I love bruschetta, and these bites look super easy to make. Thank you for sharing at Merry Monday! Those look wonderful! Thanks so much for linking up too at the Table It Link Party and Hope to see you tonight around 5:30 when this weeks party goes live.